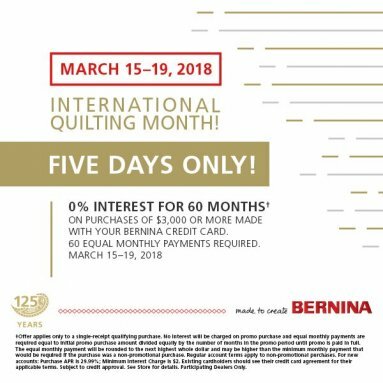 Did you know it's International Quilting Month?! It's Quilting Month everywhere in the world in March! To celebrate we are offering 60 months no Interest with Equal Payments on all qualifying purchases. Get that quilting machine you have always wanted and make 2018 your year! 20% off METTLER ( ISACORD, COTTON SILK FINISH, METROSENE ) and AURIFIL Threads ALL MONTH LONG! Don't forget to get your machine serviced this spring! It's spring cleaning time and if you are going out of town for Spring Break, now is the perfect time to drop your machine off for a Spa Day while you are going out of town!